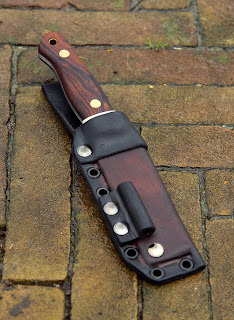 I made a new model I’d like to hear your thoughts about..
After some try-outs and prototypes I believe this one is good enough to show here. I only have some crappy pics cause the lighting is dim and it’s freezing cold, but I will make better ones in the near future. 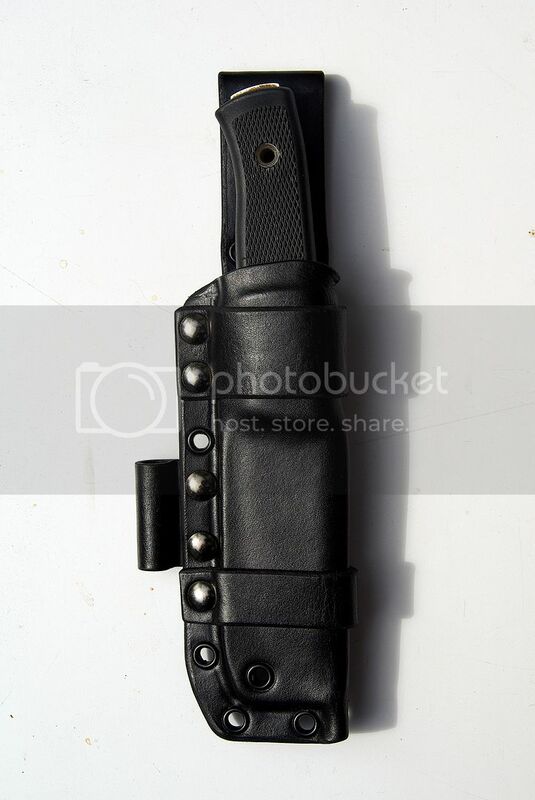 It’ll give you the idea for now. 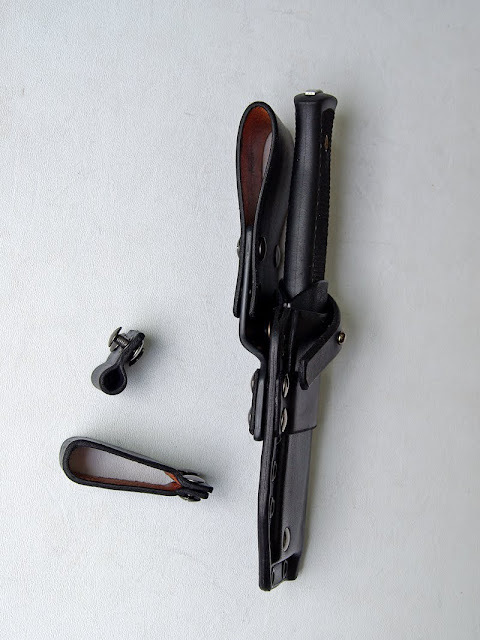 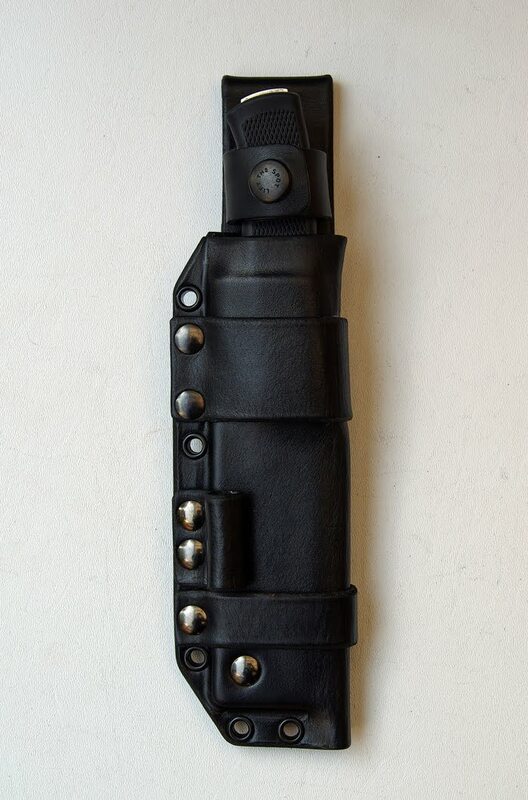 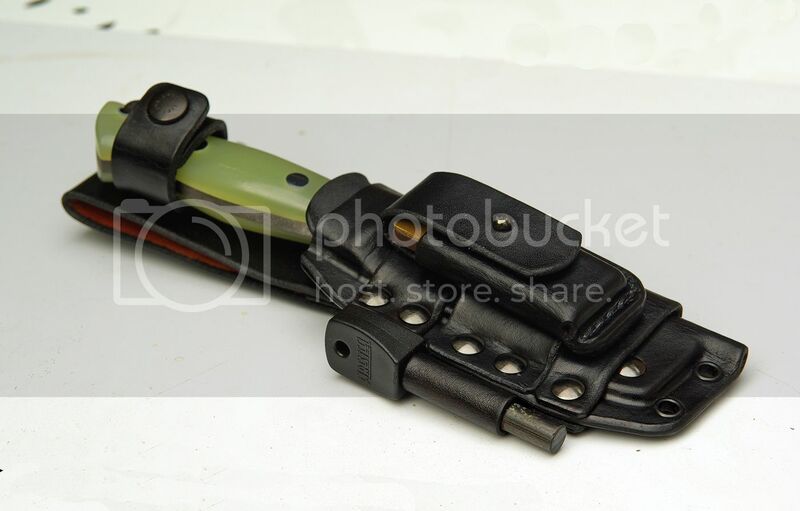 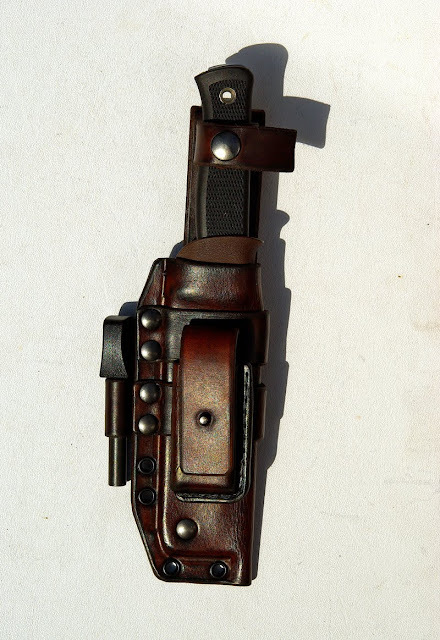 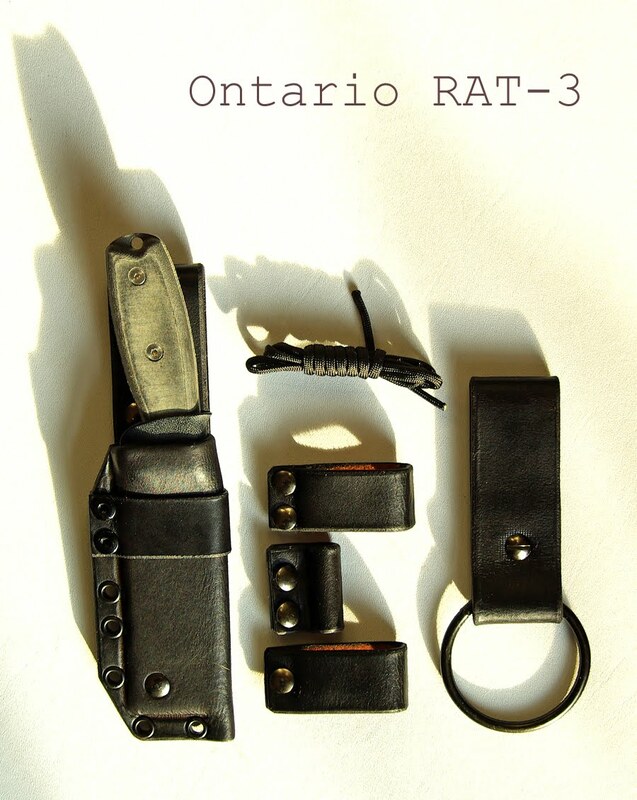 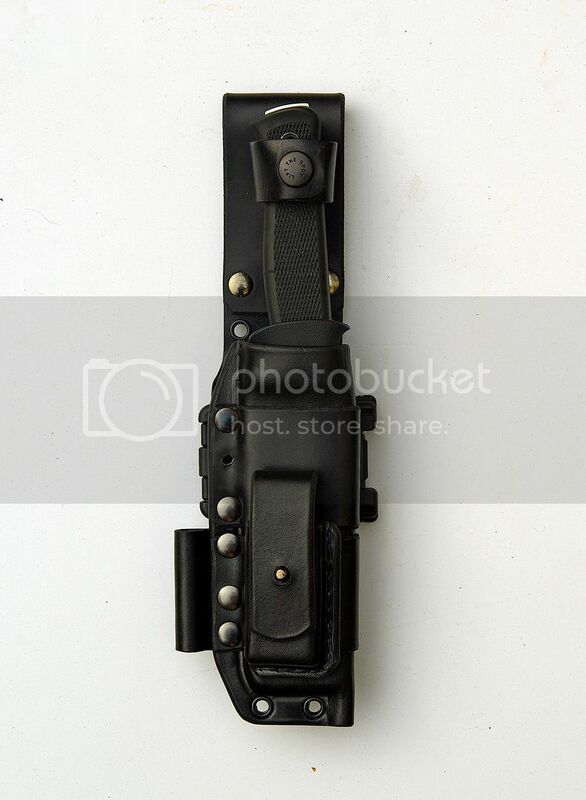 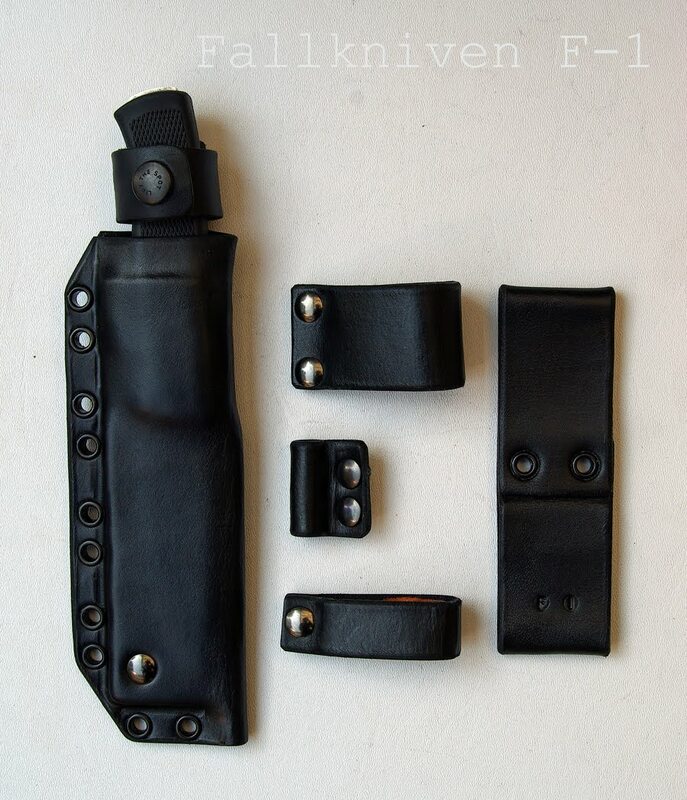 It has a halftanned leather pouch and a removable kydex liner. 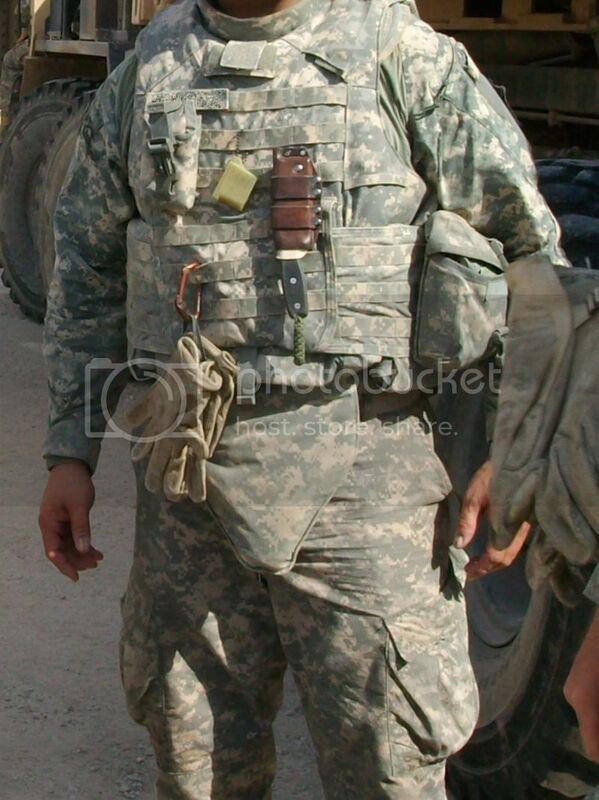 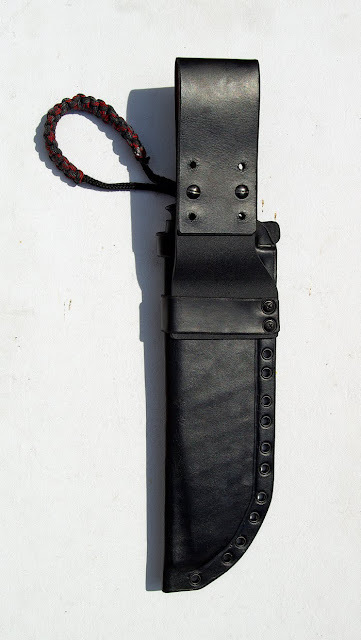 a Chicagoscrew secure’s the kydex inside the pouch. 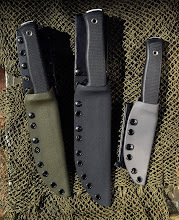 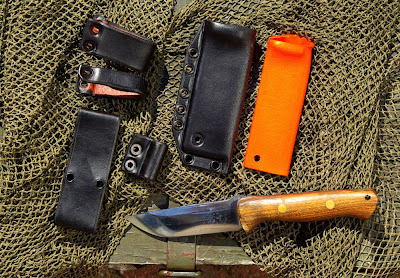 On the side there’s a row of eyelets that will fit all kinds of accessories.The kydex is light coloured to make visual inspection easier, and to have a clear aimingpoint when resheathing the knife. 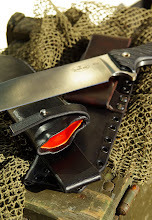 The kydex is cut under an angle to have a larger opening for resheating, and to have something to pull on when removing the liner. 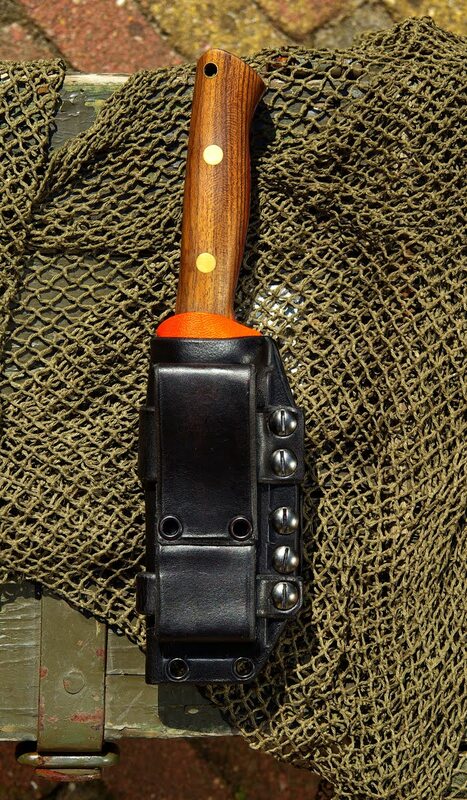 It can be set-up with a large teklok in horizontal, vertical and canted positions. It can be setup with a beltloop for high, med or low carry. It'll fit the Blade-Tech molle loks. 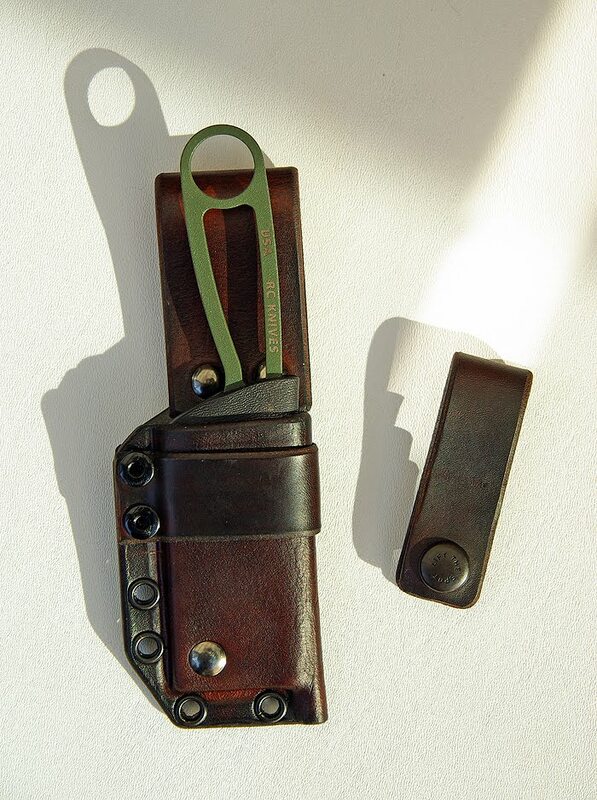 It will fit all pouches in the Maxpedition style ‘Single Pouch’ or custom made pouches. 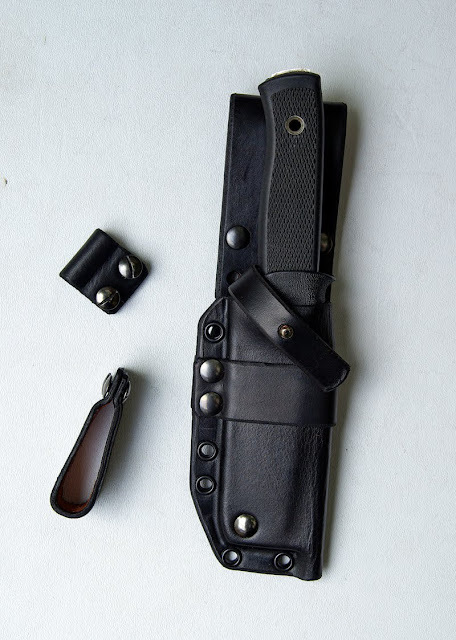 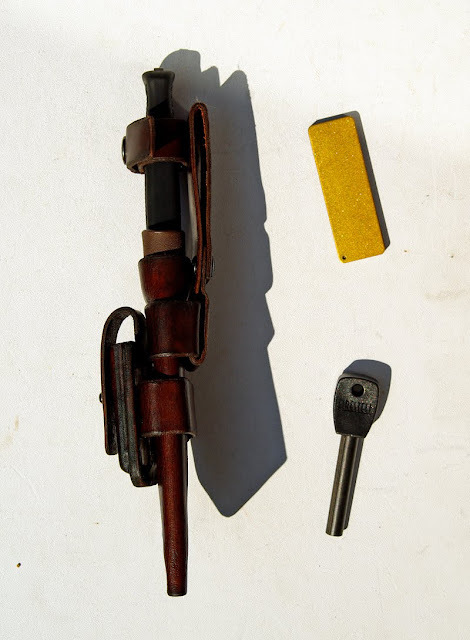 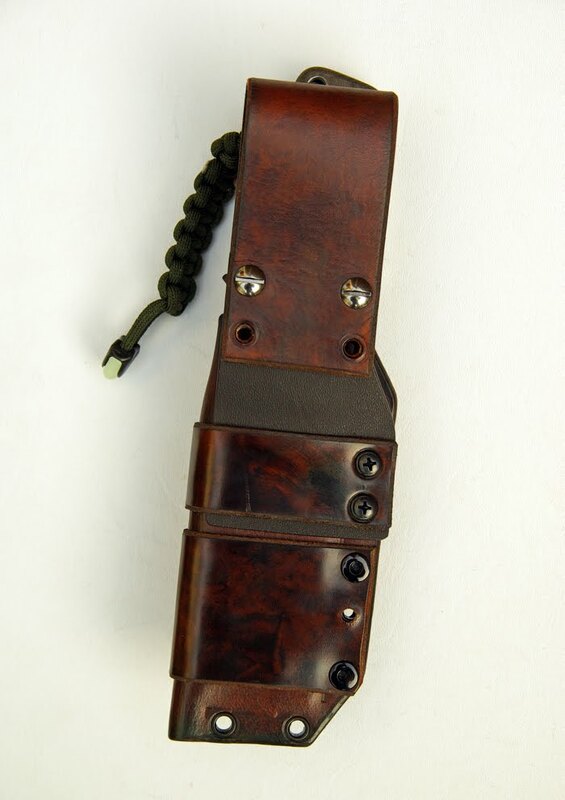 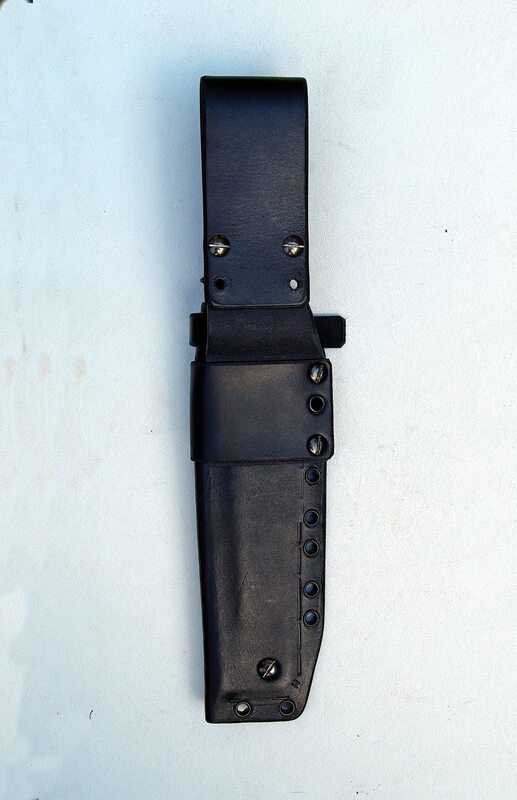 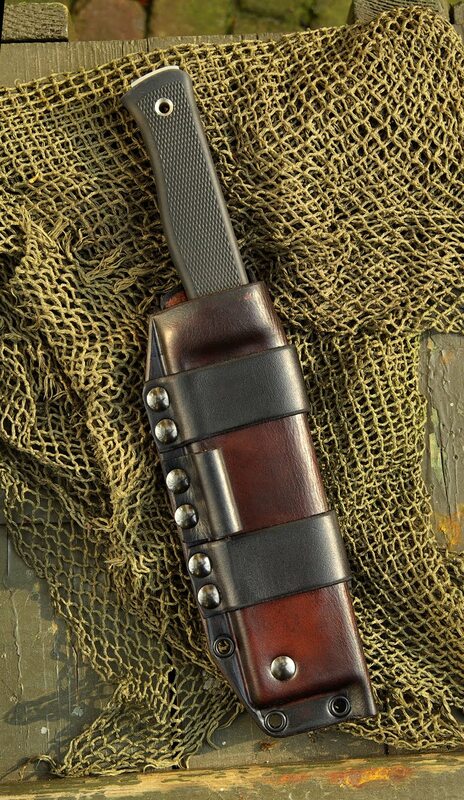 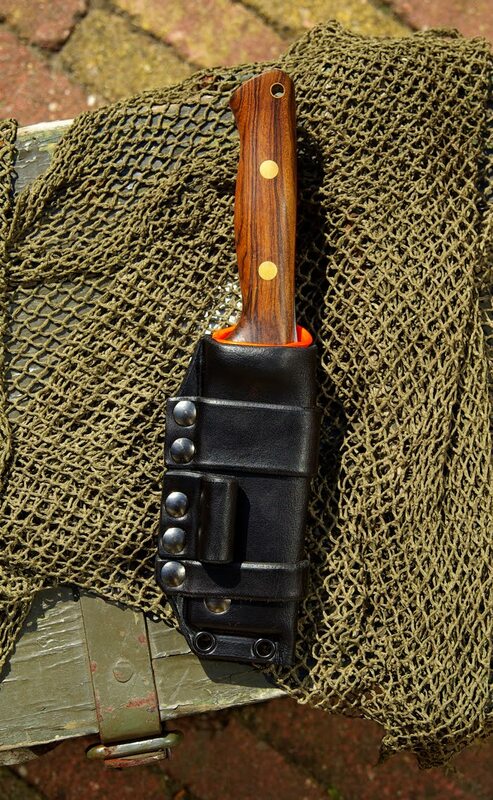 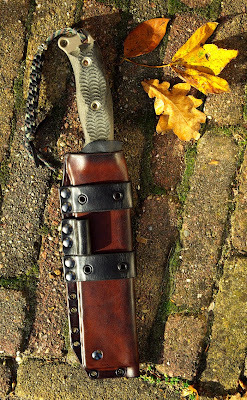 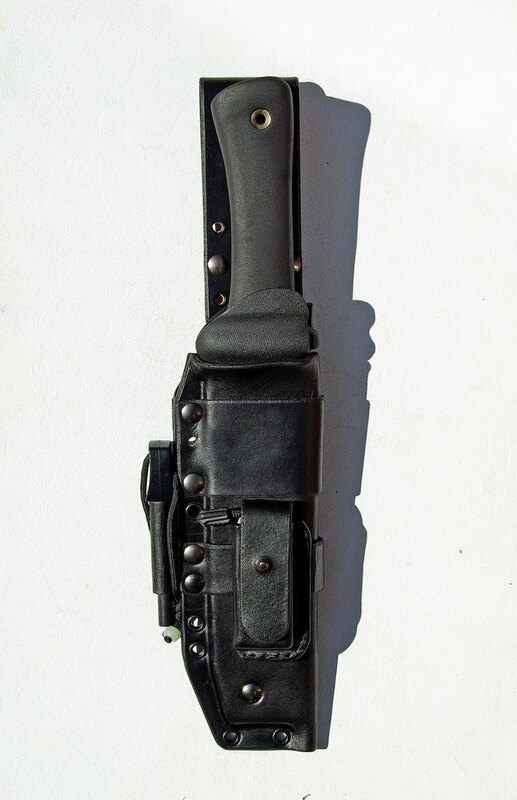 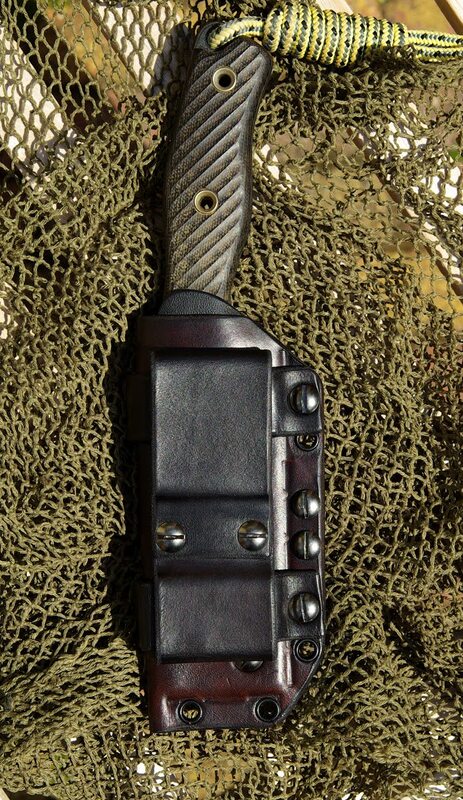 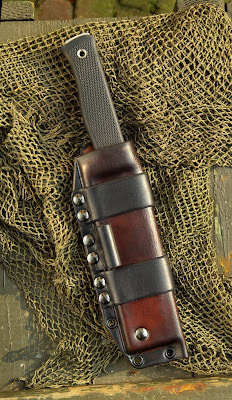 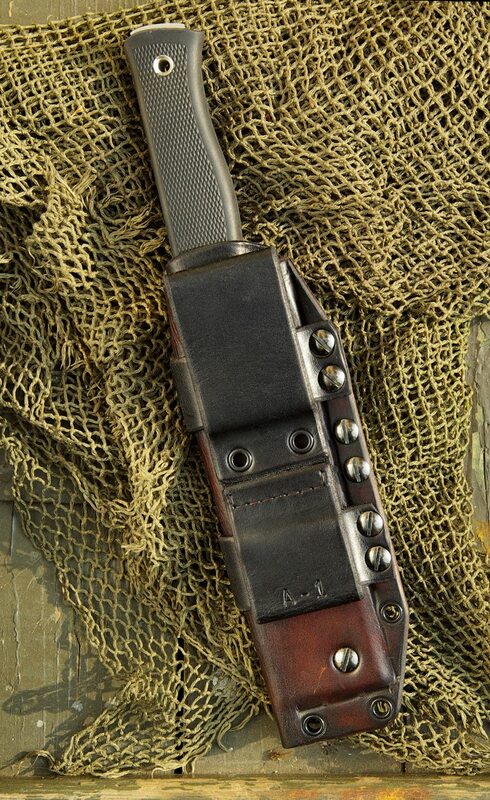 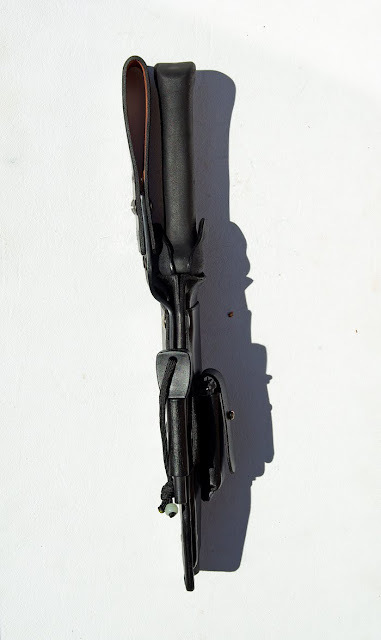 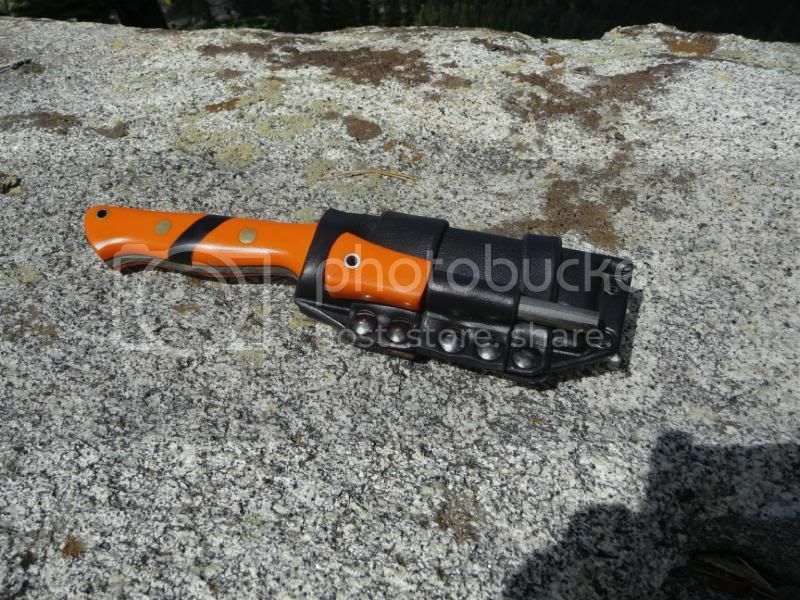 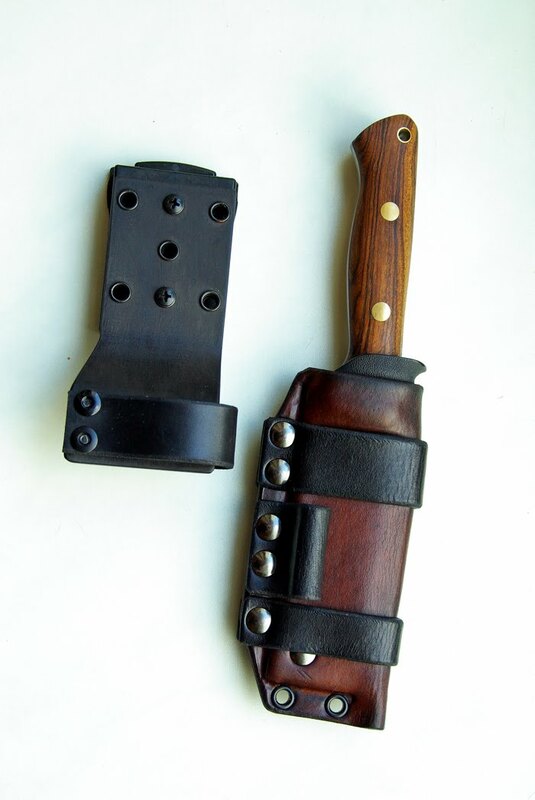 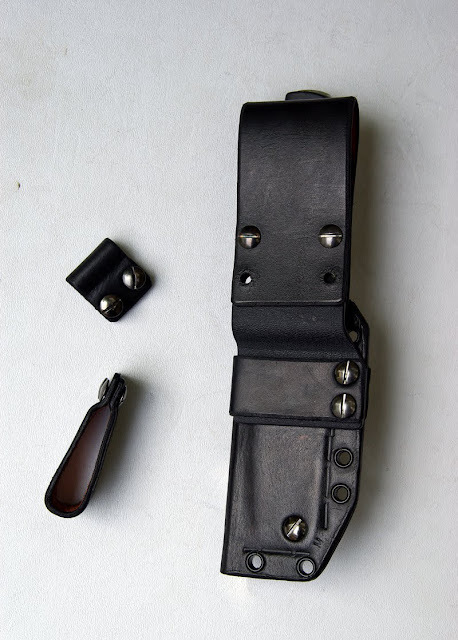 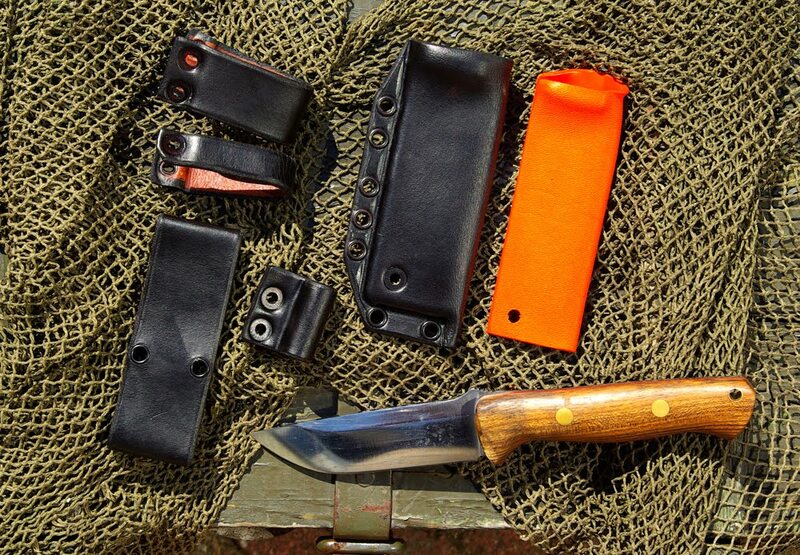 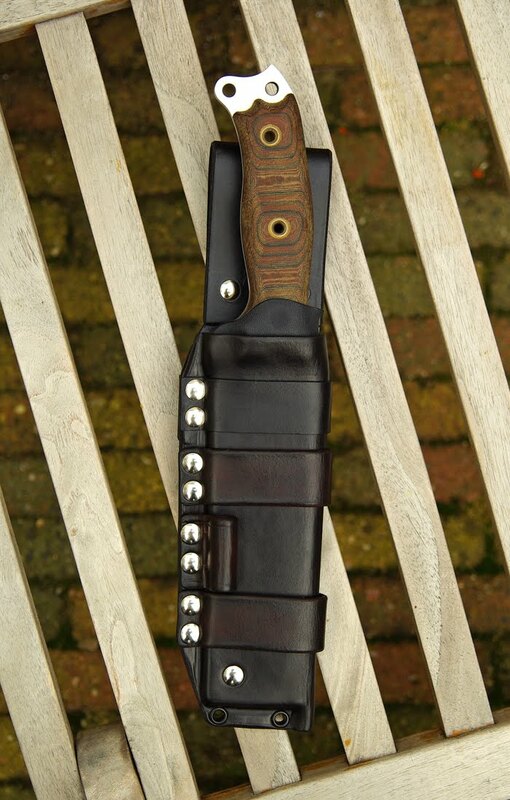 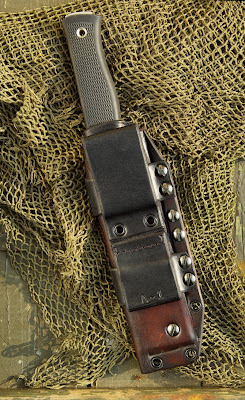 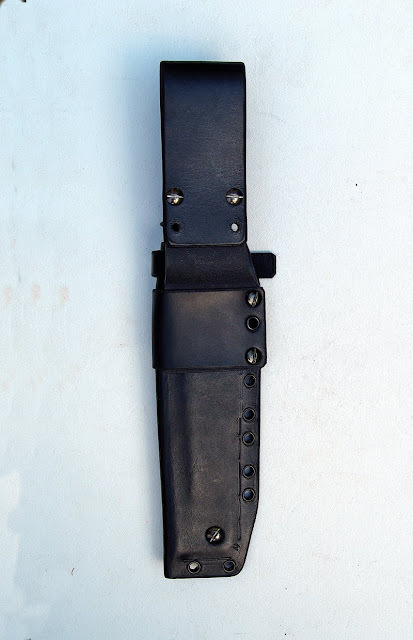 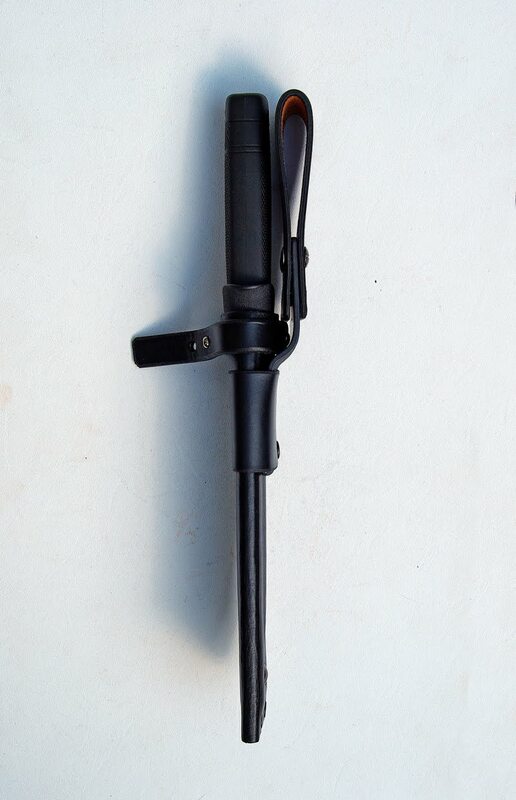 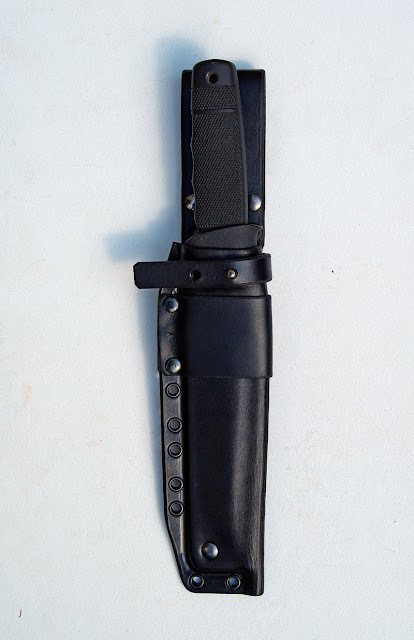 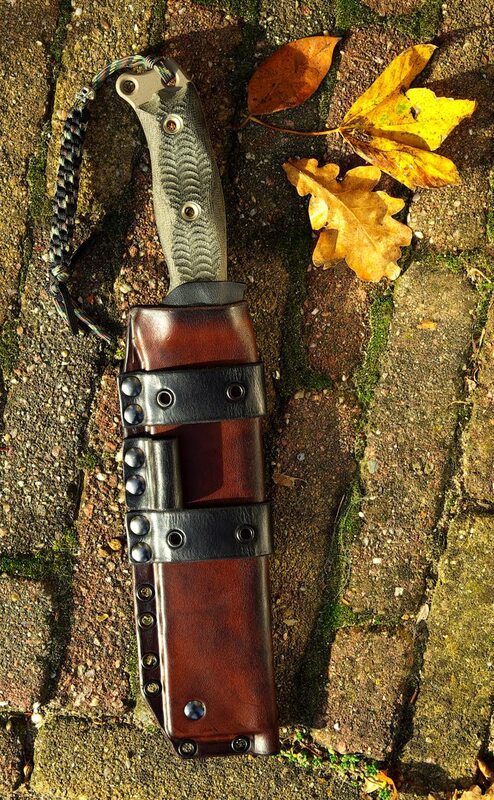 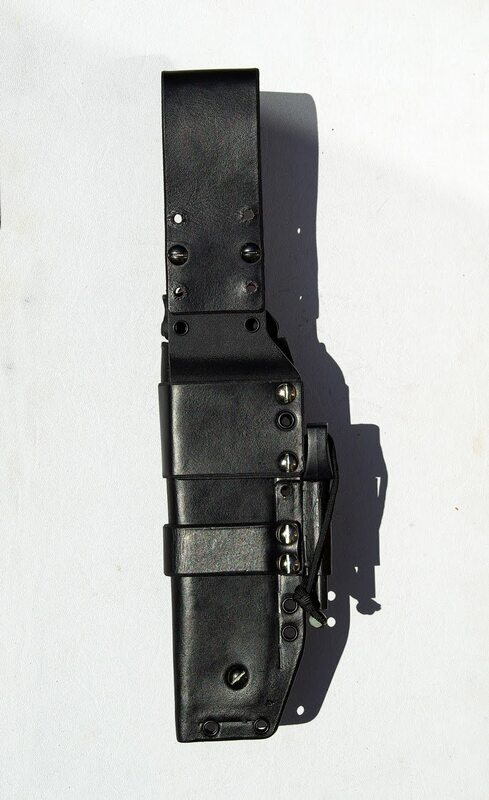 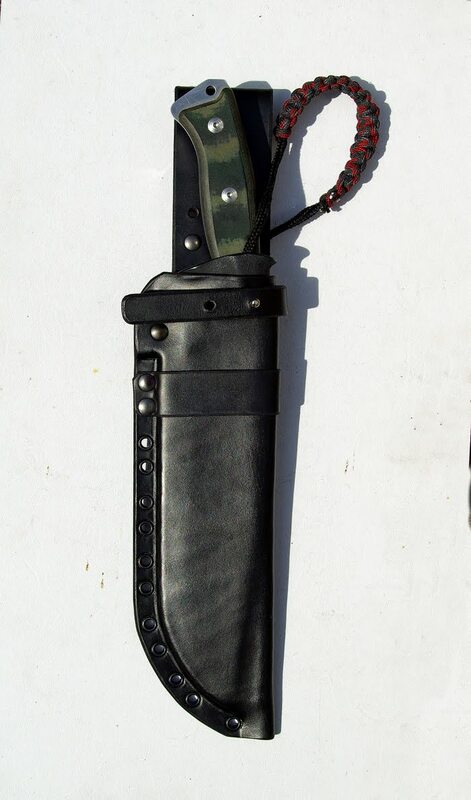 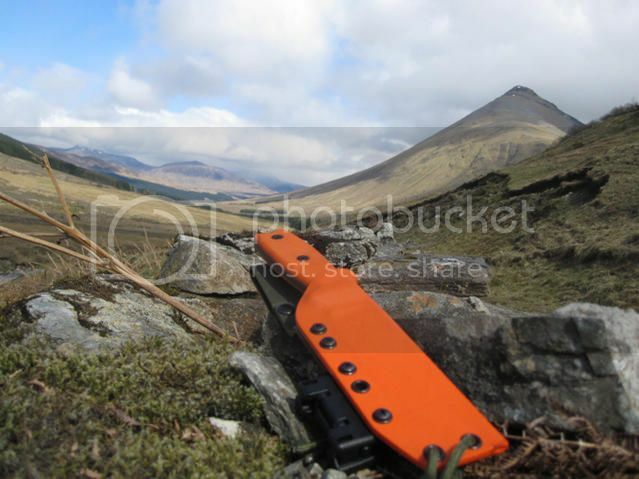 The firesteelloop can be mounted inside or outside the sheath profile. 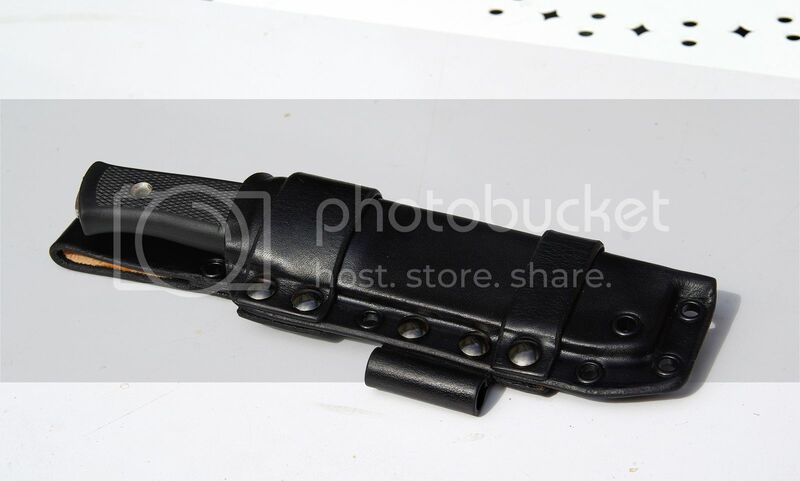 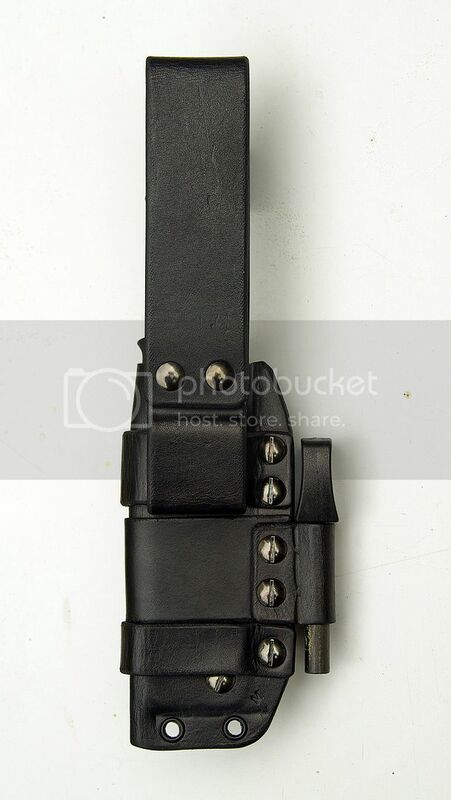 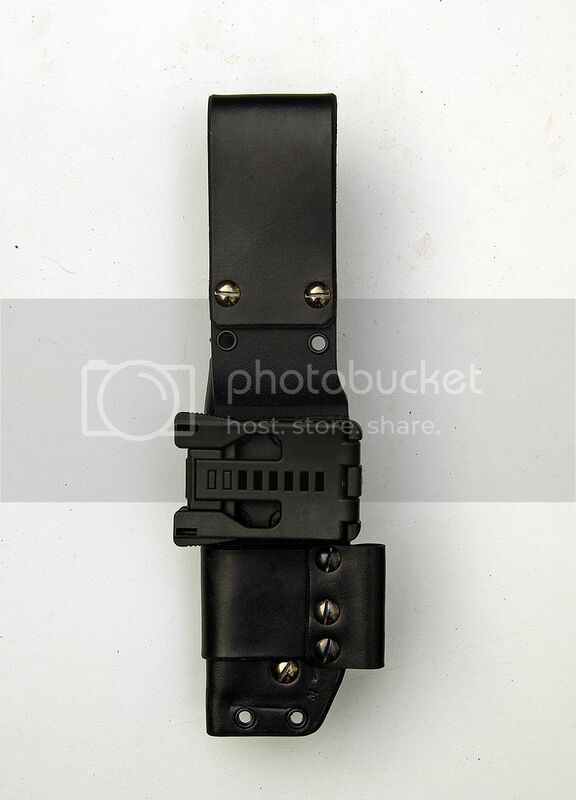 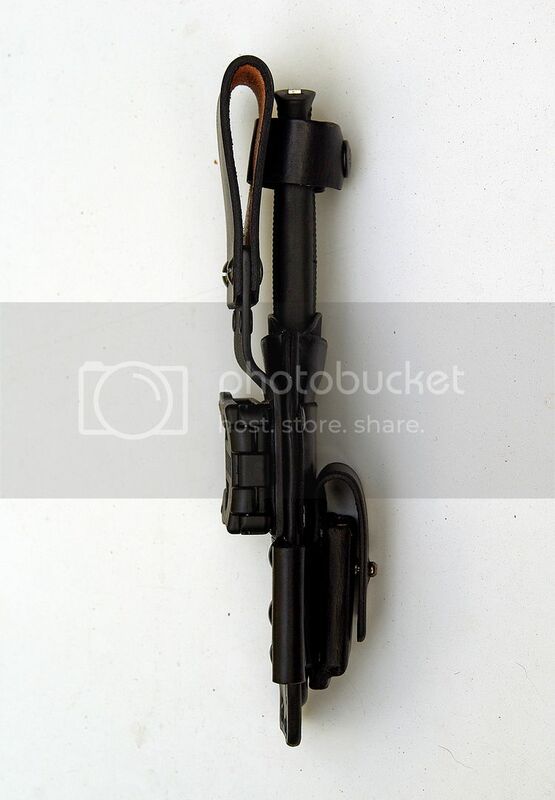 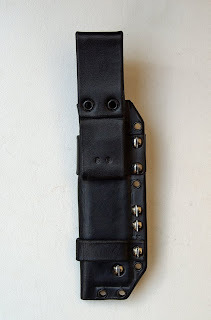 It can be carried horizontal on the belt using the loops. 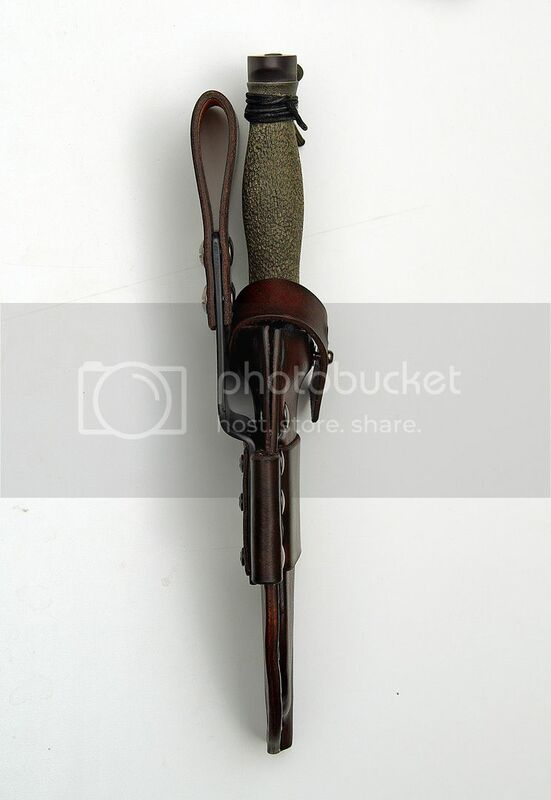 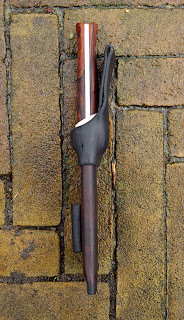 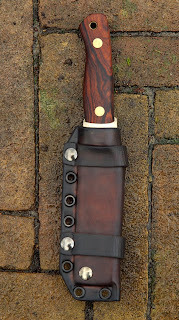 It does show a lot of handle when carried horizontal, making it somewhat handleheavy. 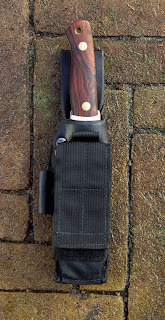 Taking up the toploop like the sheath beneath compensates that. This one is optimized for horizontal carry. One pouch could fit multiple liners for different knives. 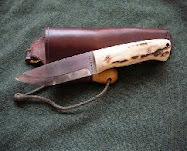 As an example. 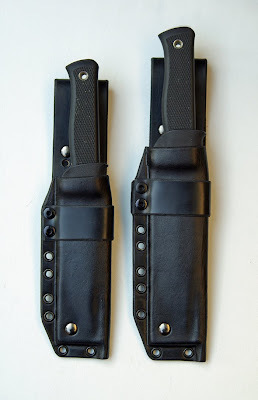 One pouch could fit liners for a series of popular knives like the Fällkniven F-1, or Rat Cutlery’s RC-4 + all other knives that, a bit more or less, have the same profile and length. 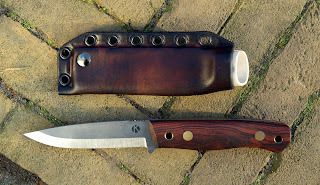 a year later this turns out to be one of my most popular models. 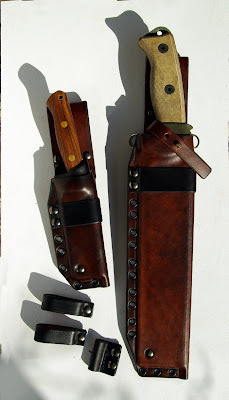 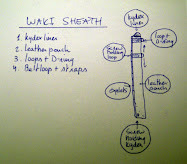 After making a lot of these the Technical Bushcraft sheath has evolved a bit further now, and some changes are made. another change is the opening of the sheath. 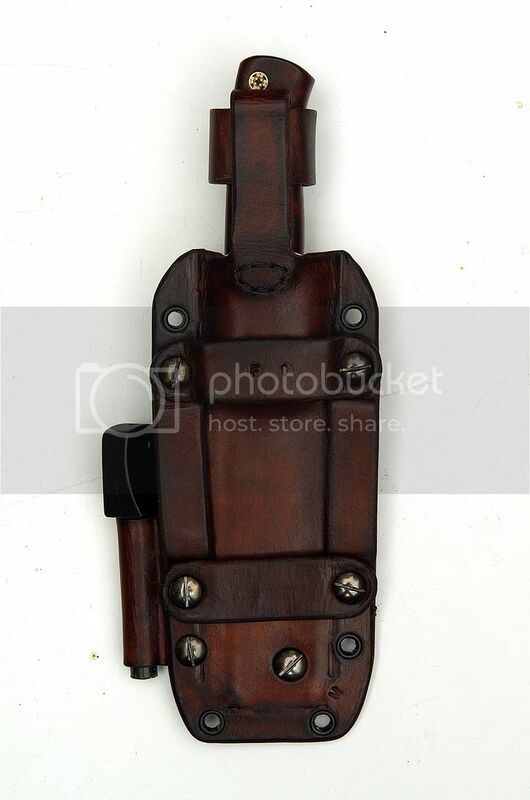 Instead of an assymetrical opening I now focus more on having a comfortable thumb push. 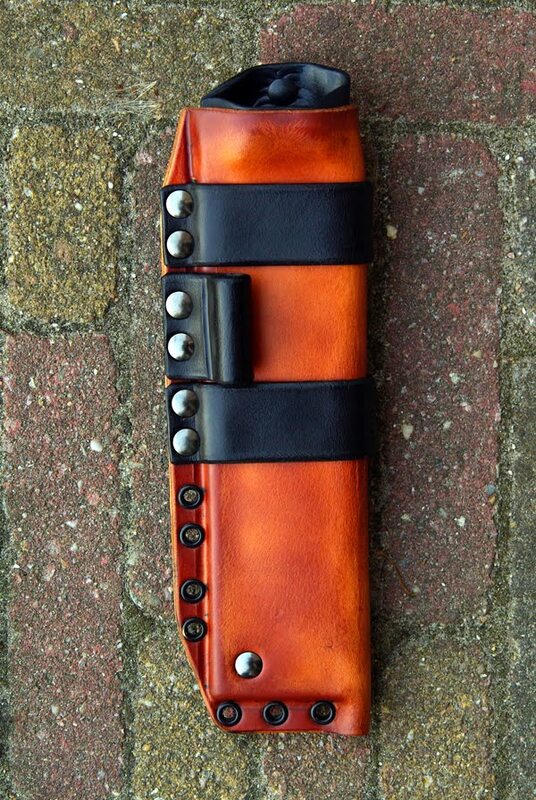 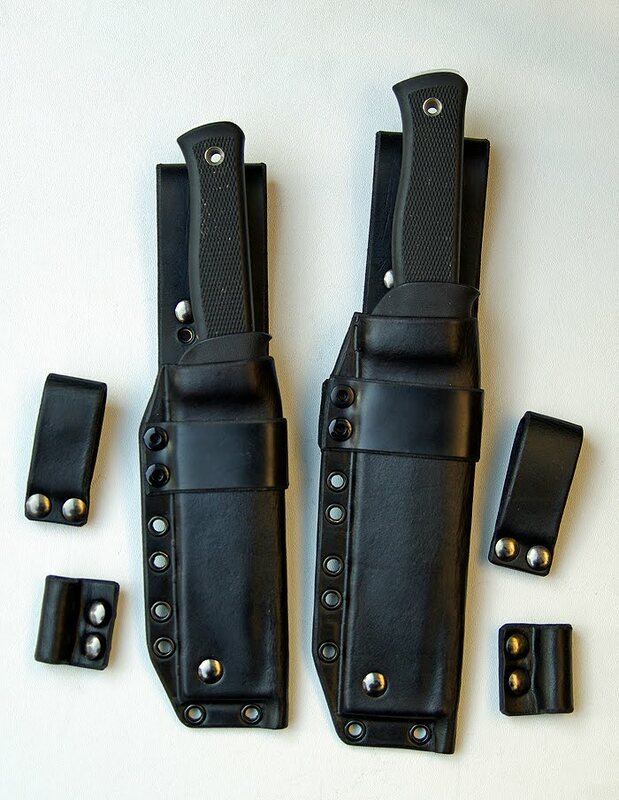 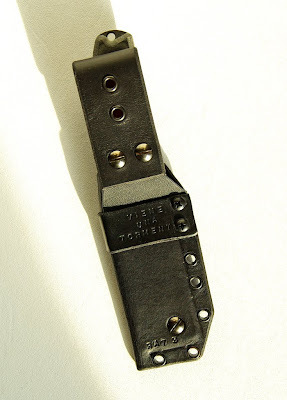 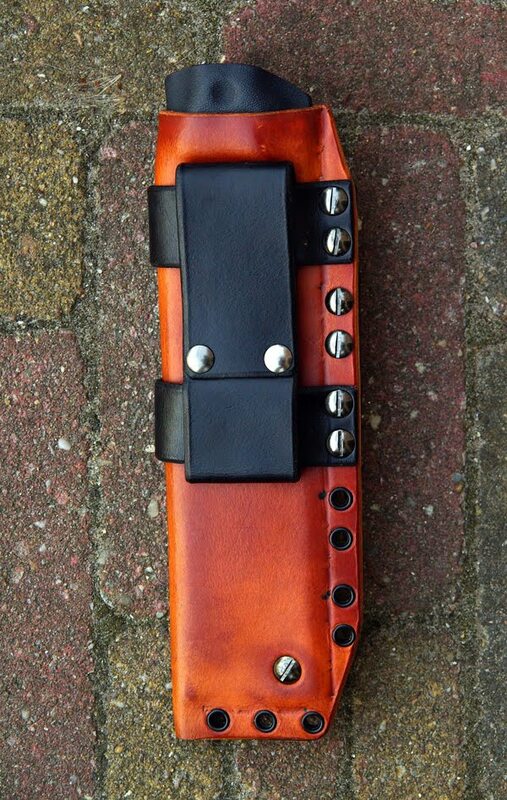 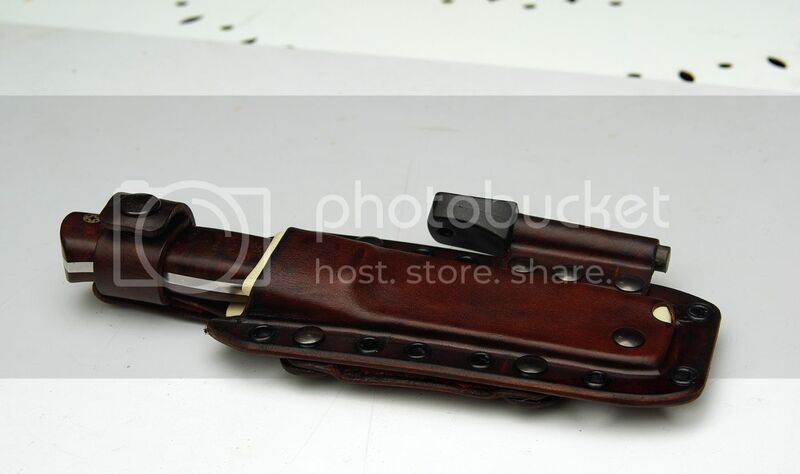 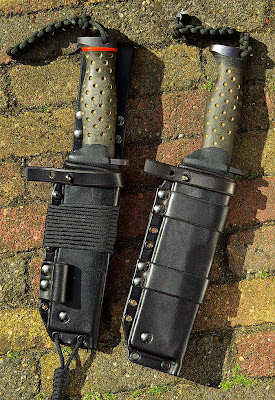 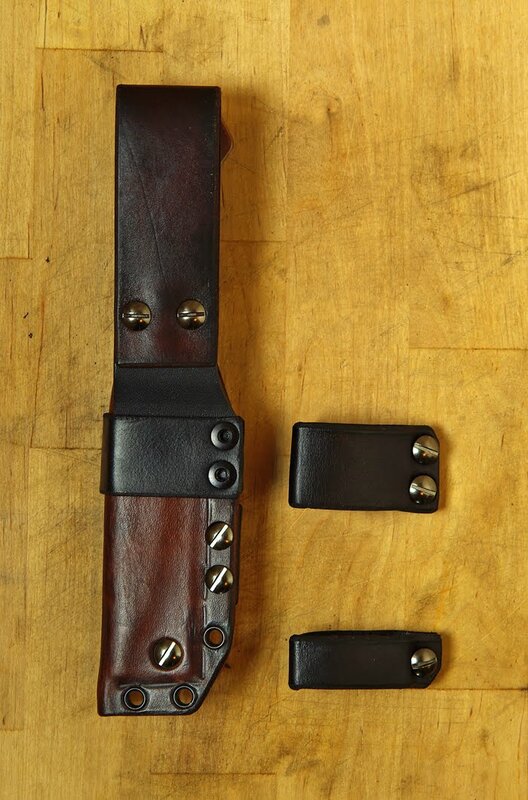 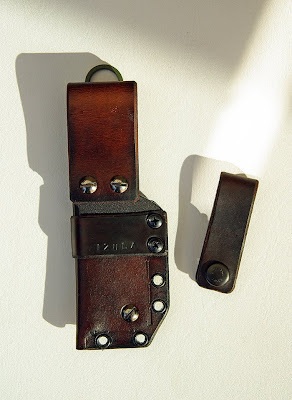 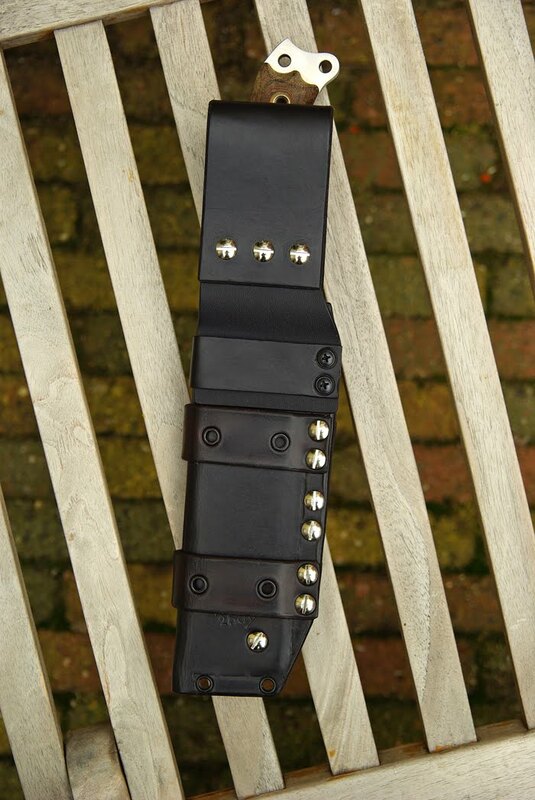 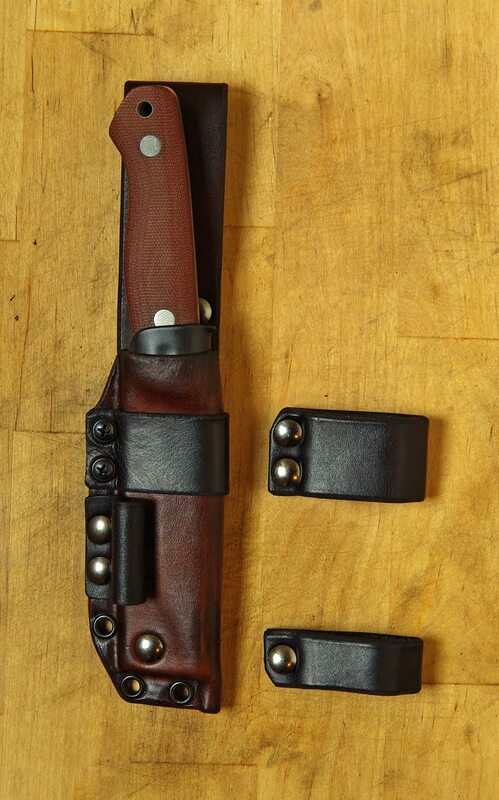 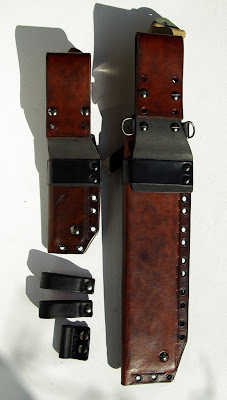 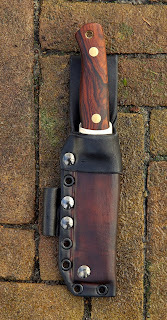 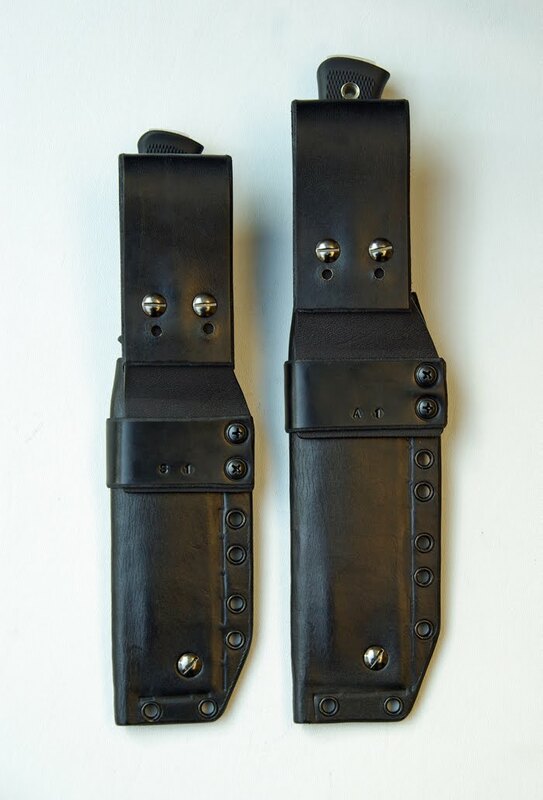 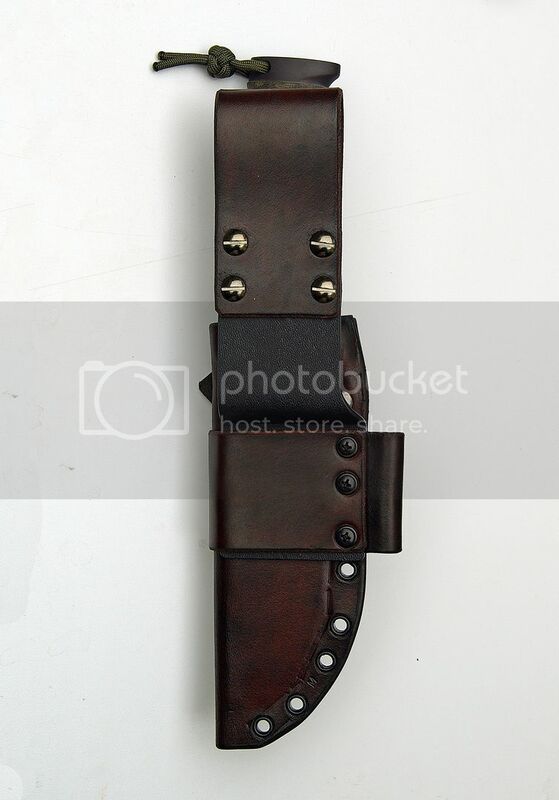 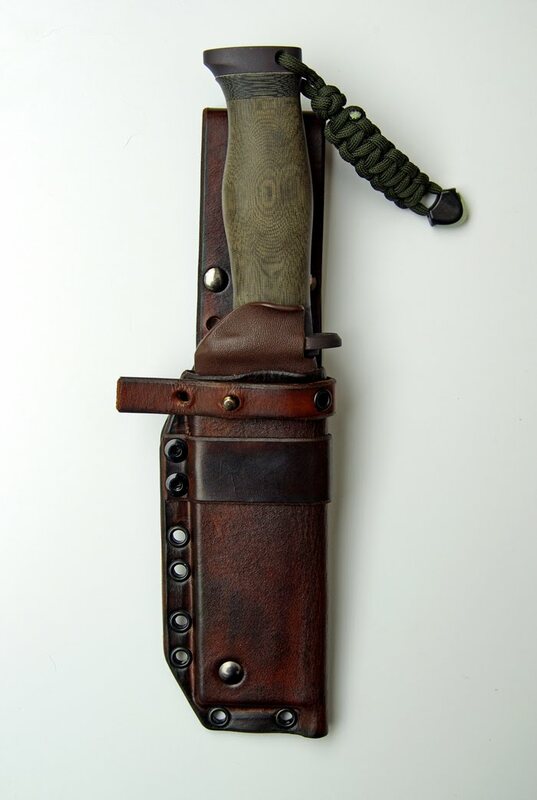 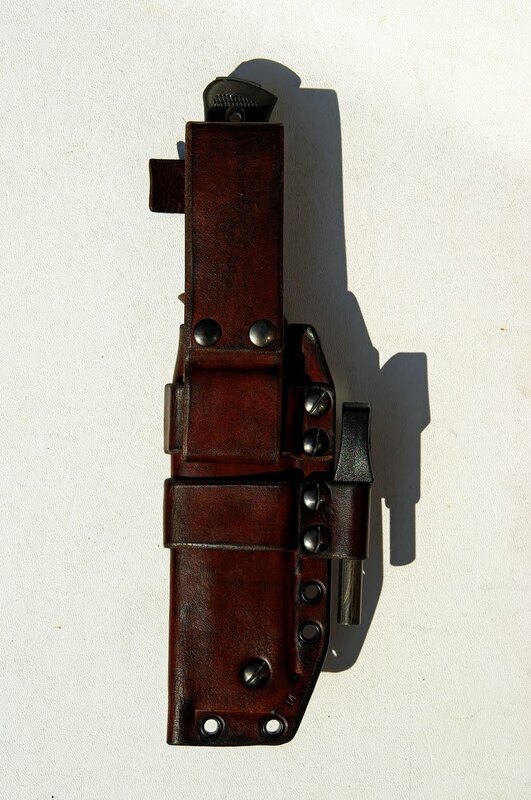 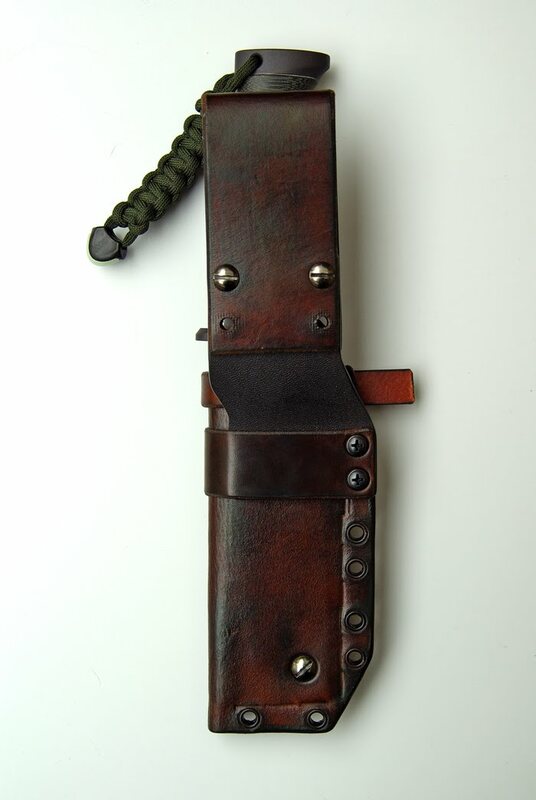 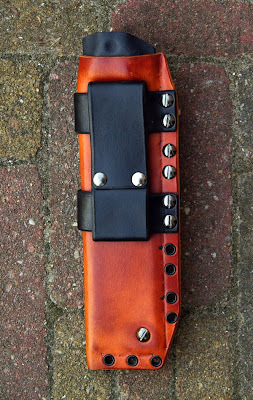 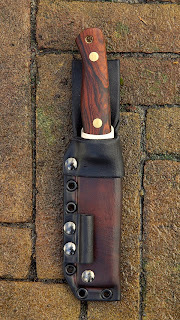 I changed the set-up of the eyelets, and made it standard on all my sheaths. 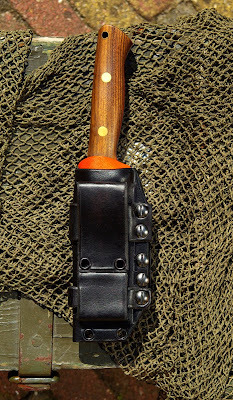 It makes for parts to be exchangeble and easy adjustments to other heights of carry..
this is how I'd like to do the thumbramp from now on..
the pouch fits the Fällkniven DC-3 stone and could also be worn seperate on a belt. 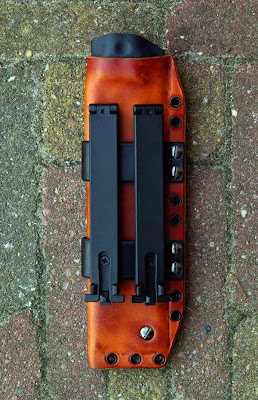 no kydex backplate, but the loop instead.. The screw that secures the kydex sits near the opening, so the bladeshape can be followed. 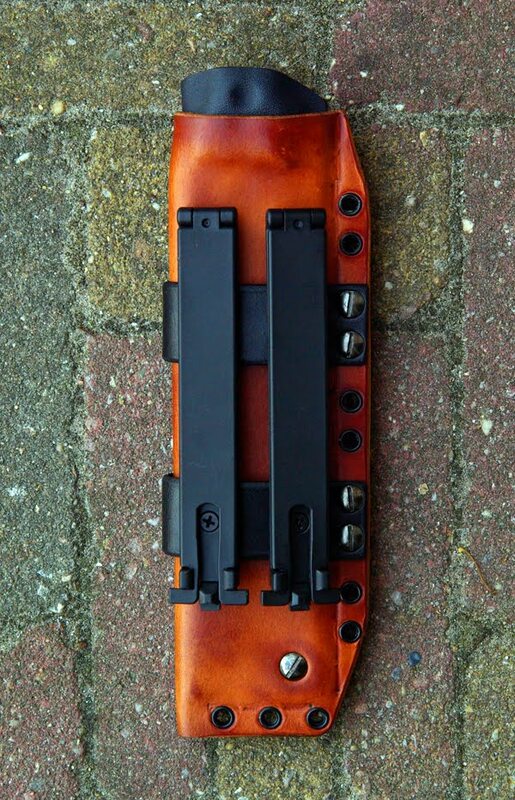 That really is a beautiful piece of work! 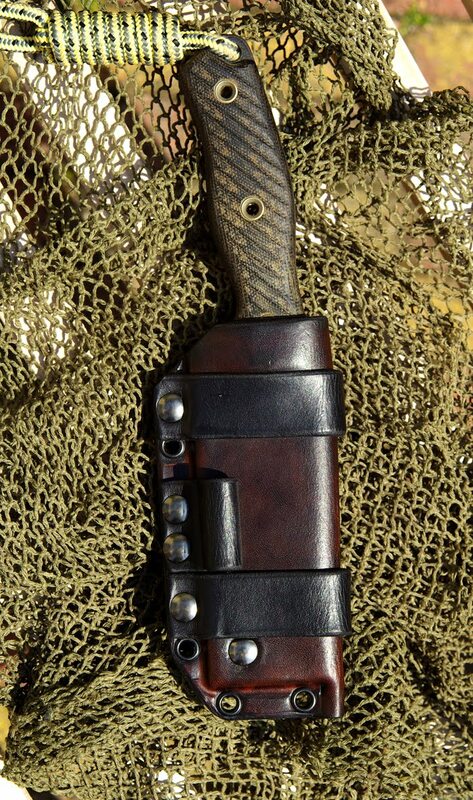 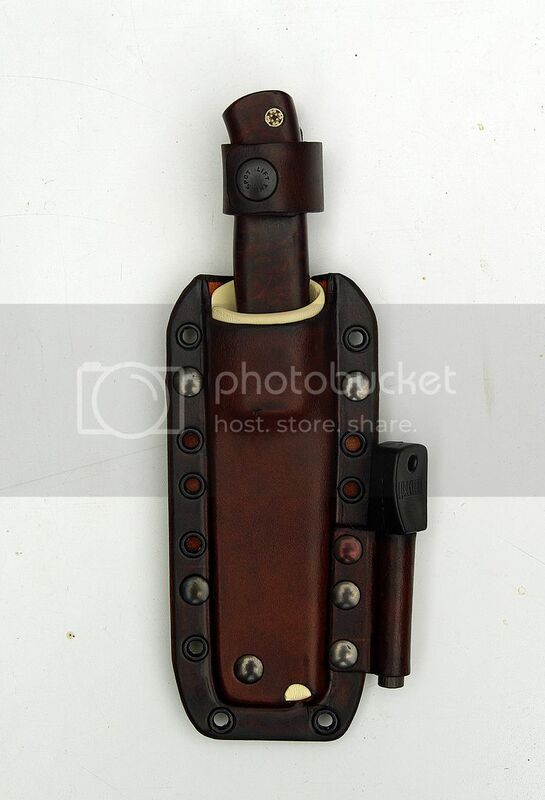 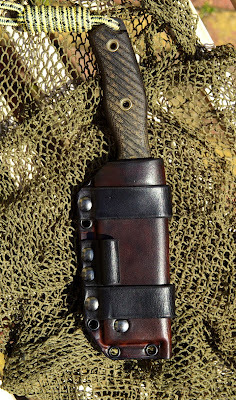 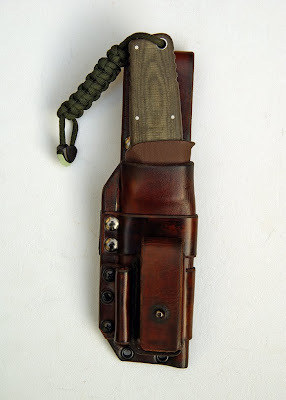 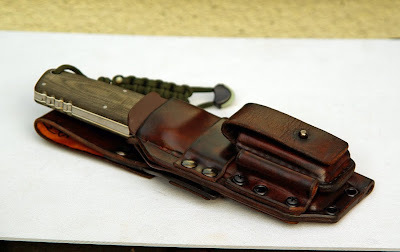 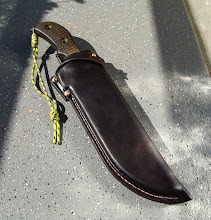 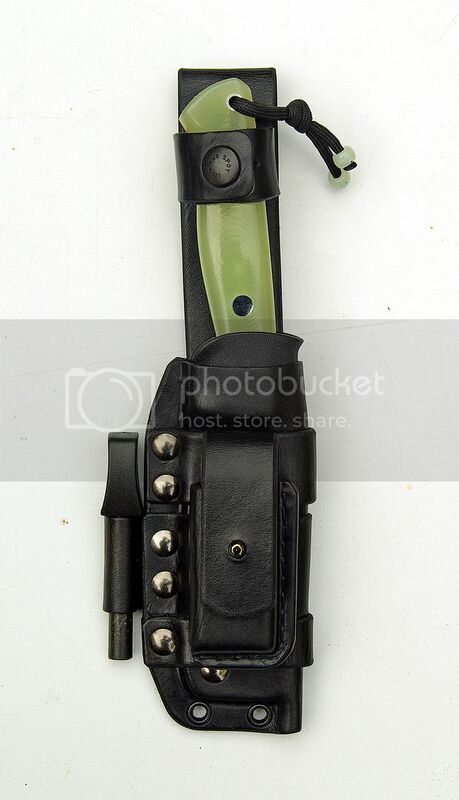 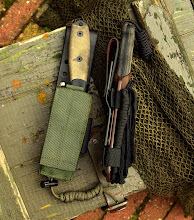 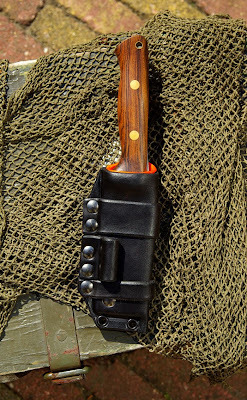 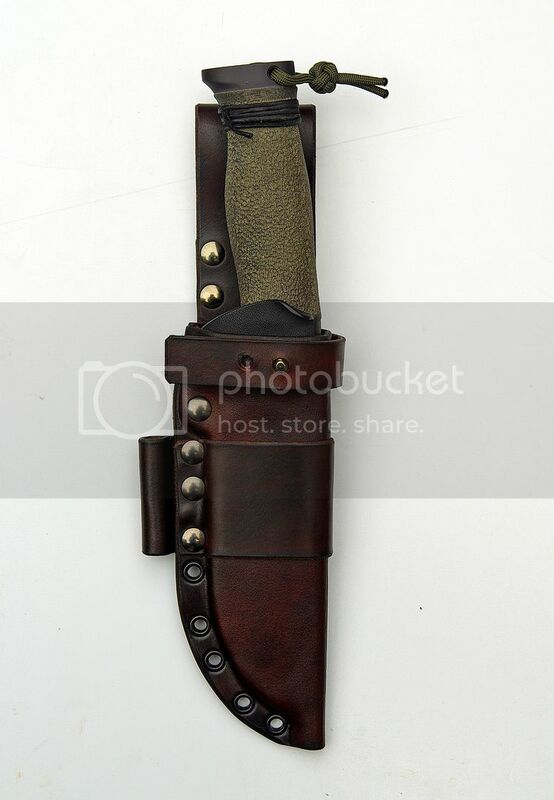 I really like the technical bushcraft sheath. 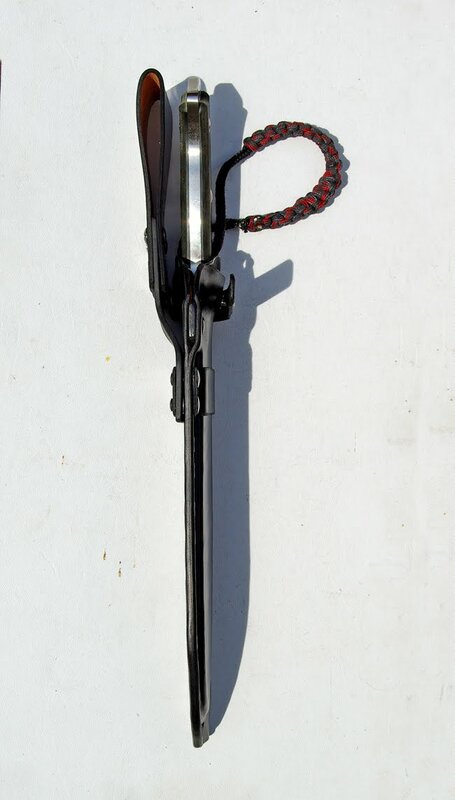 In fact I like all the work you've posted on this blog!